So tasty! Anything new in the pressure cooker is a bit like Christmas morning…either you open the lid to the most perfect gift, or you know immediately it’s getting returned, and you’re scrambling eggs for dinner. This recipe from Coco Morante’s book, ‘The Essential Instant Pot Cookbook’, won all kinds of awards in our house, and was definitely the perfect gift. My only alteration was to add more chicken, so I increased the amount of sofrito as well (3/4 cup from 1/2 cup), and even though the photo doesn’t show it, we all loved the addition of a dollop of Greek yogurt. 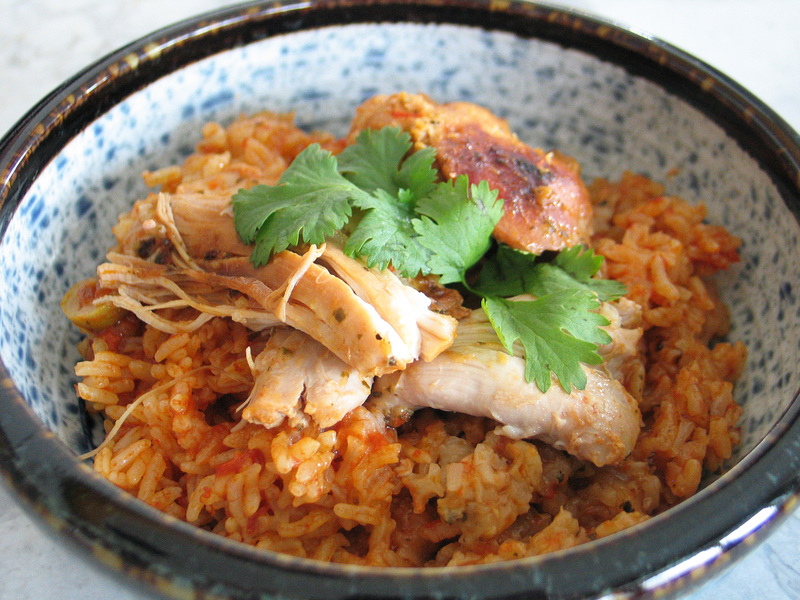 Since one batch of sofrito makes enough for 4 or 5 Arroz con Pollo meals, this is a very quick and easy dinner for a rushed weeknight – enjoy! Measure all ingredients into your food processor and blend until a thick paste forms. Measure out a good 3/4 cup for this recipe, then portion out the rest into freezer Ziplocs to freeze for future meals. Select the Sauté setting on your Instant Pot, heat up the oil, add in a 3/4 cup of sofrito and cook and stir for a couple of minutes until the mix has softened. I recommend pressing OFF after about 2 minutes as the Sauté setting gets really hot…and will keep cooking as you add your other ingredients. 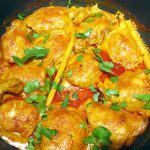 Add the olives, capers and chicken and stir to combine, then adjust the ingredients so that everything is level and sprinkle the rice evenly over all. In a separate bowl or large measuring cup, whisk together the broth and tomato sauce and then pour this mixture over the rice, making sure that all of the rice is in the liquid. Use a spatula to scrape down the sides of your pot so that there are no stray grains left behind. Secure the lid, set the Pressure Release to Sealing, reset the cooking program, select Poultry and set the cooking time for 15 minutes at high pressure. Let the pressure release naturally for about 15 minutes when the cooking process is complete (I usually leave mine for a half hour or so), then move the Pressure release to Venting to release any remaining pressure. Open the pot and use a big serving spoon to scoop down to the bottom for servings of both chicken and rice and then garnish as you wish with cilantro and Greek yogurt.